Luxury camping! While camping is a great way to unplug from the everyday, glamping – short for glamorous camping – takes it to the next level! Colorado glamping vacations offer the ideal balance for you rustic adventurers who love the crackling of a campfire, but also the comforts of a cabin. Our single queen tents accommodate 2 guests with a cozy living space of 14’ by 16’. Built on an attractive redwood deck, your tent includes an ultra-comfy bed with linens, lamps, love seat, desk and chair, and an outdoor porch with chairs and table. 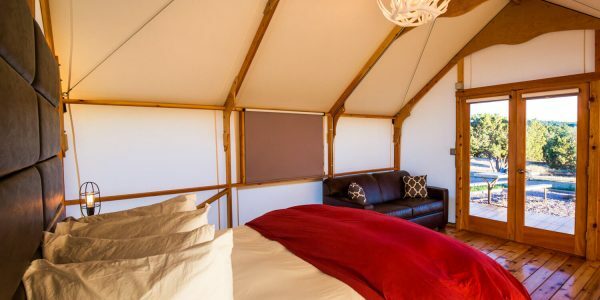 Ideal for a romantic Colorado glamping getaway, these tents can be rented from one night to up to a week, and are available for rent May through September. Designed to accommodate up to 4 guests, our double queen tents are built on a concrete slab with in-floor radiant heat for those cooler early or late summer glamping vacations. These luxury camping tents include two queen beds with linens, attractive lighting, wicker seating, desk with chairs, and a large outdoor patio with more seating and a table. Double queen glamping tents are available from a single night rental up to a week, and are available April through October. Each luxury camping tent has multiple electrical outlets so you can power all of your toys, and you’ll have access to free wi-fi. While there is no running water or bathroom in the tents, you’re just a short distance from our shower house and bathrooms (open 24 hours a day). Your Colorado glamping experience is still camping, so bring along insect repellent, and please understand leaving your door open will allow uninvited pesky bugs to join you in your tent for the night! To us, luxury camping in Colorado means your tent is furnished, so don’t worry about bedding, pillows or towels – we’ve got you covered. Showers in the nearby shower house include spa-style dispensers for shampoo, conditioner, and soap, so you can leave those toiletries at home. We don’t allow pets, although there is a reputable pet boarding facility nearby. Our Colorado luxury glamping tent rentals are located one hour from Colorado Springs, 10 minutes from Cañon City, and close to a number of outdoor adventures and attractions. Check out our things to do page to round out your glamping vacation, or visit our Insider Info page for some pre-planned itineraries! Or better yet, call us about luxury glamping in Colorado and just ask our friendly phone staff – we’d love to help you plan your perfect glamping vacation getaway!